Full jeep or truck bedliner - My comprehensive report on lining the exterior and interior of my truck, a jeep, or any vehicle with a DIY bedliner. For those seeking to get full truck or jeep bedliner applied, I learned a lot. Buying a new or used truck was such a hassle. I was never set on driving my pickup or jeep for the sake of joyrides. I, like most owners of utility vehicles have but one concern and that concern is functionality I’d get from any pickup or jeep. It seems like a shame it is that previous truck beds wasted away under the abuse of hard labor were it not for the advent of truck bedliners. It appears that practice of protecting truck beds has been around since the fifties with wooden planks until in 1983. Looks like Rhino Linings was founded after that. My study showed a polyurethane mixture proved this durable, affordable, and long-lasting liner better than drop in deals. Looking deeper still, this coating is actually polyurea, not polyurethane. I learned that MythBusters tested out bedliners applied as a means to protect against dents on fenders in minor crashes. These days, I see do-it-yourself bedliners are much less money than having a shop do it. They claim easy to apply, but as for being cost effective, all except 3 DIY bedliners I found are not polyurea; these were called Al’s, Spray-Lining & Coatings, and Super Liner. Apparently all other DIY bedliner kits are just thick paints. In 2013, USA Today released an article extrapolating from the circulating trend of car owners who are applying bedliner to their entire vehicle through customized, professionally done jobs. Personally, I found myself reluctant to invest in such an endeavor, and might speak for a majority of people who might also be afraid of committing to what could be a smart move on their part due to potential mistakes in product or service choice. Protective coatings look as if they can be the cutting edge between reliability and affordability. Why? So far I see that few people realize that it actually costs much less to have bedliner applied to the exterior of your vehicle than a new paint job. The process of applying bedliner is much easier, whether the bedliner job is being done at a shop or if you were to do it yourself. Auto paint is actually much more costly than polyurea (bedliner). Good auto paint is well over $300 per gallon. Auto paint actually requires much more skill to apply than applying a bedliner. Maaco, a popular chain of paint shops specializing in body work and overall paint jobs, can charge upwards of several thousands of dollars for a complete paint job on any vehicle. Some estimates I tried were over $12,000 dollars for a Maaco paint job. Even more unfortunate is the quality of Maaco paint jobs are not considered super quality. USA Today gave out a price estimate of 5,000 dollars for a custom Rhino or Line-X (who are competitors) bedliner job for a full size vehicle. Auto paint can be twice that! Also, I learned that when choosing the right bedliner for your vehicle caveats uncovered here was enormous. It matters whether the company is selling a quality product or if they're aggressively advertising their bedliners despite them not being up to par with actual Polyurea vs "fake Polyurea” under the title of “bedliner”. Only Polyurea / polyurea hybrids are high quality bedliners; my study showed urethane, polyurethane, and epoxy deals sold, usually by big companies do not carry high strength specs necessary for true protection. The main difference between Polyurea and Polyurethanes becomes evident at a molecular level, the molecules come together differently where polyurea is much more durable than polyurethane and polyurea. All can be applied yourself but again most DIY bedliner deals, especially the cheapest ones are simply insufficient. They are usually higher cost urethanes, etc but at such low quantities to appear as lower priced. As for “professionals” vs DIY I found some resolve with yet more confusion: In Orlando, Florida at Line-X of Greater Orlando, an exterior job was 5,500 dollars alone not including interior which, for an unstripped jeep or similar vehicle can tack on an additional 1,900 dollars leaving the total of over 7,000 dollars before taxes. Calling Line-X of St. Louis, the owner Stan gave an estimate of a bedliner job at $8,000-9,000 dollars for a full Line-X job. Since polyurea is cheaper and easier to apply than paint, these figures seem inconsistent at best. Seeking a proper competitor for a legitimate comparison yielded some more faltering results: KC Customs in Kansas City, a Rhino dealer, doesn't even do jeeps according to James the shop owner and head applicator. Additionally, J & J Toppers and Truck Accessories in Illinois, also a Rhino place, recommended Missouri Spray-Lining for the job as John, an associate at J & J Toppers, could not get behind the idea of applying Rhino Linings to a jeep, truck or any exterior for that matter. I don’t believe Rhino itself is bad in any way, yet verifying other dealerships, Rhino dealers of Casper, of Laramie and Riverton in Wyoming are dissatisfied with Rhino products for exterior jobs. Some phased out full exterior applications entirely. Tilton Body Works in New Jersey, another Rhino dealer, gave an estimate of 4,000 dollars for a comprehensive job but figures are still inconsistent. ProTech in Montana said that they advised against doing an entire Rhino exterior job as the liner is too thick when applied and could prevent assembly of truck parts after the disassembly necessary for application. This seems strange as the Rhino should be applied as necessary to function in door jams, etc. Unfortunately for ProTech it seems as if Shane at their shop isn't well acquainted with his own Rhino products or the application of polyurea in general. His price estimate, 800 dollars for JUST the tub of a Jeep (under 40 sq. ft.). That too seemed incorrect. Therefore, calling over a dozen spray-lining type dealers all across the nation have yielded varying answers and from all of them a resounding truth remains. Despite exterior bedliner being a prudent alternative to auto paint jobs as an effective method of preserving your truck, few shops know what they're doing and given the lower cost of polyurea, the ones that do will charge an arm and a leg. The options also seem to be limited as Rhino Linings dealers- also cautioned against full exterior jeep or truck jobs job due to, “high waste involving high pressure guns necessary for application”. FYI: most shops don't know the differences between product types of their own bedliner vendors. I know that there are several different Rhino or Line-X types yet even these applicators are unaware or unable to obtain any choices. The majority of shops couldn't tell you the difference between Spray-Lining & Coatings or Line-X or Rhino products much less would have knowledge of exterior application. Plainly applying bedliner to the entire exterior or interior of your truck has differences. It's shameful that most bedliner dealers focus mainly on beds when Polyurea has so many uses! The fact of the matter is that do it yourself bedliner kits are trying to pave the way towards a low-cost solution to protection of truck beds but have no exterior verses interior choices. So where to start looking for, "true quality" DIY bedliner? Again, I started with what the bedliner is made of. Polyurea is the standard when it comes to bedliners and makes up the basis for the largest bedliner titans of the industry. Rhino Linings and Line-X products are both made with Polyurea as is a generic other brand called Spray-Lining & Coatings. That SLC also had DIY bedliner kits up to snuff with these kids on the playground. Spray-Lining and Coatings which charge under a few hundred dollars for the supplies including spray equipment but knowing that you get polyurea matters. I saw instructions, technical support, and quantities here that come out to be half as expensive in all retailed DIY’s. Analyzing SLC, it’s owned by Flexible Lining Systems and has dealers competing with Line-X, Rhino or few others but sells these DIY deals too. There doesn’t exist any DIY kits that are specifically for jeeps or truck exterior at all besides the ones from Spray-Lining and Coatings. Application also seems doable by an amateur (like me). I could risk pulling the trigger on an even cheaper Do It Yourself bedliner deal. Leading the way in cheaper DIY bedliner deals is Duplicolor which I saw in auto parts stores like some main competitor among DIY kits. Raptor, made by UPOL of Great Britain is shipped to America had complaints as being thin and brittle. But it’s a two part product which should be more adhesion than say, Herculiner (one part stuff) but still isn't this real deal… polyurea. OK, my last verification was calling two SLC dealers: Norm, the main applicator at Kens Flexible Armor, in Corning Ca. who is near me, SLC dealer #119 (855-707-1503). 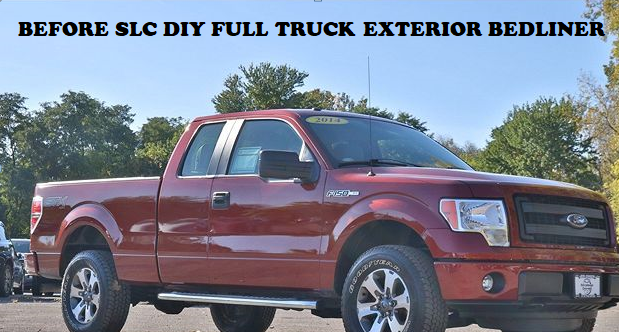 They were $3,800 to spray exterior and interior of my 2014 F150, with harder low-flex exterior, soft flexible inside. I compared to Rhino Line-X Alternative, actually Corpus Christi Bedliners in Texas (no SLC dealer # but at 855-707-1503 got transferred to them). That manager was Todd who I also called. Same deal there was $3,650. I now compared their stated thickness in mils, 90 to 140 mils to materials included in the corresponding SLC DIY jeep kit- https://store.sprayliningandcoatings...-bedliner-kit/ . Cautious, almost paranoid but feeling clear I now spent $896.00 + frt = $971.00 with choice of cartridge system or hopper sprayer. That’s cheaper than professional bucks for a similar job. It’s being shipped to me now. I’m getting my 2 car garage organized, in hopes to apply this stuff myself with promised support from them. I should have time to update you but any experience, perspectives, or opinion will be appreciated. * My Disclaimer: I take no liability for pricing or any details of this study. Phone #’s or names were provided to contact each vendor or entity on your own. Sounds like the above post is yet another SPAM post by Spray-Linings & Coatings. I reported it as such yesterday but it doesn't look like any action has been taken. Your posts are helpful as mine are but your comment on spam is hypocritical: I now looked up truckgasm a little- you submitted 436 posts with Line-X stated. In your Line-X posts you boast and point fingers but it appears that other members with experience in Rhino, Spray-Lining & Coatings or others are not so apprehensive about you as you are with SLC. In posting here the intention is to help F150online members, correct? So I hope you're careful with your authority so as not to disturb less authoritative members (like me) in trying to lean from those like you as we promote our experiences. I did contact Line-X, because of it's national recognition; but mostly because of your own positive if not overabundant posts. I then located comparisons of Spray-Lining & Coatings to Line-X and others. That with your help gave me that intention to shop various F150 upgrades plus DIY full jeep (truck) bedliner as I posted about. Line-X had no DIY which led me shortly to the SLC DIY I bought. Aside from additions to my F150 because of you, thoughts of becoming an SLC dealer now evolved. So I’ve appreciated your helping others and me with Line-X, in that you’re seemingly a knowledgeable guy. RE-FYI: it’s your advise that inspired me to spray my full F150 with DIY polyurea (unavailable through your or any Line-X place). In spraying SLC’s full jeep DIY Bedliner kit I’ll definitely consider this as a business... I doubt we, (you & I) are abusing anything. Many F150online members will get honest info & help. I literally found SLC due to your Line-X advice bc further research proved a Line-X business to be over $300k where SLC is under $20K... So while I appreciate your knowledge, Truckgasm I cannot admire your hypocritical finger-pointing as apparently an alternative to Line-X may be a lot better. For all members I'll post pics once this full truck exterior & interior bedliner is finished. I joined this forum in 2004 which is about 14 years ago. Everyone who has been here a while knows that I'm a LINE-X dealer and I've never tried to keep it a secret. So, I'm going to disagree with the hypocritical accusation. I suppose 436 posts over 14 years is actually not much at all! Everyone is entitled to their opinion. However, sometimes, there are mistakes in material facts regarding a subject that I have advanced knowledge in, especially when the subject is related to LINE-X. In those cases, I'll submit a post to correct the mistakes. That being said, I've corrected MANY posts from those who seem to represent Spray-Linings. The average LINE-X franchise fee is $20,000. (If you're a veteran, you can knock off $7,500). After that fee, you can spend whatever you want on your franchised business, it's wide open and it's up to you. Last edited by TruckGasm; 01-03-2018 at 03:55 PM. 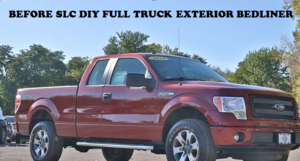 ive been long thinking about getting my '03 f150 exterior "bedlined" thanks for the detailed review of options at a national level! For what it's worth, I have Line-X. 12 years later, and the Line-X still looks and performs like brand new. Is that because the Line-X material is good? Is that because the franchisee did a good job with preparing the surface and applying the product? Maybe both. I don't know. I don't care. In my case, I am a satisfied customer.